Does your team need some help coming off the bench? Trying to get the home court advantage? 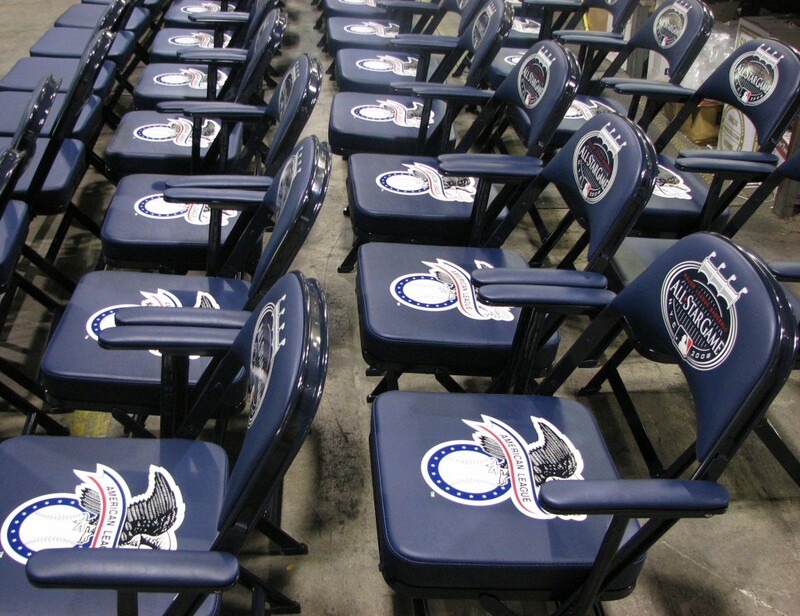 At Athletic Seating, we can get yout locker room and your team Sideline Chairs to look like champions! Your school can have the same chairs used by the pro’s, with your teams logo custom screen printed on them. The Sideline Chairs and the Locker Room chairs are made by Clarin by Hussey, the number one name in seating…..not some knockoff chairs. And, they are made in the U.S.A…..not Taiwan or China. With several choices for colors for the frames and vinyl, we can custom design your Sideline Chairs, Locker Room Chairs, and Logo Stools to your teams colors. We are carry several different models of storage carts so after the game or event, they can be neatly put away and rolled away until the next big game. The Clarin by Hussey chairs come with a 12 year warranty…they are built to last. And our expert graphics and designers will help you make sure that your teams logo will never look better!